As I promised before: here's the real announcement of my custom pattern giveaway. You can take part by leaving a comment to this post, until the stroke of New Year (GMT+1). Your name will be entered in the draw twice if you place a link to my blog, either in an own post, or among your links. On New Year's Day I will pick a winner at random (I think I'll just write down all the names and pick one from a hat) who will recieve the pattern of her choice from the designs shown below, lovingly handmade to her size by me (your Burda size would be all I need to know, but if you know you've got issues with e.g. the back length or shoulder size they use, let me know). You don't need to take your pick or tell me your size just yet. I will announce the winner on the blog and ask her to mail me her choice and size. this little shrug which you may have seen on Wardrobe Refashion already. It could be made in any jersey or knit and will come with a long sleeve option as well. 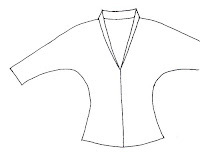 or a kimono-sleeved top with a V-neck at the back. For practical reasons, I made the back high enough so you can wear a bra underneath. You can see me wearing mine in this post. and I am considering to add a third option, something like this... I can't show you any pictures of it though, because I haven't yet made it myself. And you've been on my blogroll from the get go so my name is in the hat twice! Hi, Please enter me in your contest. I'm in! and I have a link to your blog in my sewing blogs list on my blog. Ooh how much fun is this! Hm... I like the third option, but I think it's generous enough of you even with the first two! And I added you to the list of my favourite sites on my blog http://marmota-b.blog.cz - because I should have done that a long time ago anyway! And I'm happy, because I finally managed to comment on your blog! Somehow it didn't work with my TypePad profile... It said something like "your OpenID couldn't be verified" (in Dutch, so that's my guess). What a lovely prize for a give-away. I am happy to add your blog to my blog-roll also. I really enjoy your blog and style! Please enter me in your giveaway. I'd love to have a garment made by such talented hands! Beautiful patterns! Thanks for the chance. What a wonderful give-away. Please count me in. I've followed your work on the Wardrobe Refashion blog and have now become a google folower and added your blog to my reader. I'd be very happy with any of these creations. The shrug is perhaps my pick. I want in!! 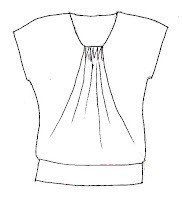 I like the kimona sleeve top. okay, i can't believe i've 1. missed your blog for this long, and 2. haven't added you as a friend yet over at burdastyle! my new profile pic over there sports a variation of your awesome jersey dress:) i'm adding you to my blogroll post haste. Hi! Your blog is inspiring me to start sewing again....when I can find a sewing machine that works. In the meantime, I'd love to be entered in your draw. Love the patterns, esp the shrug, but I love all of them. (Crossing my fingers I win)--but good luck to you all. I would love the kimono top! This is great Lauriana! Love your blog and linked to it, very cute patterns! I love the shrug, and admire your designs in general. Thanks for the contest offer! I'm thrilled to have found this site. I'm linking it in my blog right now. The designs are wonderful! And I haven't bought new clothes in over a year. I'm a big fan of the kimono sleeve top! Count me in. I found you by way of Dress A Day (the Watteau pleat dress from awhile back). Love your designs and you're on my blogroll! They are so cute! I love your creations. I remember you so well from Burdastyle, and was amazed to find your blog today. Yay! I'm always so impressed by the patterns you draft.